Heated vests or jackets are becoming pretty popular in cold weather areas. These jackets make it possible to have mobile heating without getting a full-size jacket. The vests are flexible and make people feel at ease while also keeping them warm. These vests make great cold wear when swimming, hiking, and trekking in cold temperatures. You can easily keep warm without wearing bulky clothes which is a big advantage for persons involved in various activities. However, finding the best-heated vest is not easy. The market is filled with varieties of heated vests making the selection process difficult. Luckily for you, you’re at the right place to find the leading heated vests. Some of the features to consider when choosing a heated vest include waterproof, windproof, durability and extra insulation. Read through our ten picks below and choose a heated vest that best suits your needs and desires. 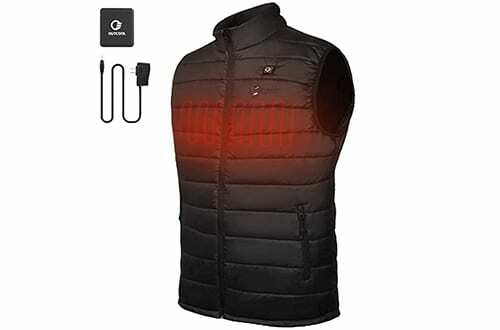 The Ororo men’s heated vest is one of the best picks on the market with a neat tailored design. It is a simple, lightweight vest with great insulation. This vest is wind and water resistant allowing users to wear it in most conditions. It is a flexible vest that offers unrestricted movement. The vest features 4 carbon fiber heating elements providing heat across the mid-back, collar and underneath the two pockets. It is a great way to keep your body and hands warm. Overall, this is a simple design heated vest with three heat settings. The jackets heats pretty fast in seconds and runs for up to 20 hours on a single charge. It is easy to use and machine washable for easy care. 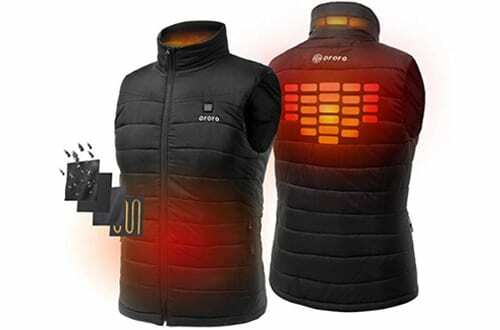 The ARRIS is another unique design heated vest ideal for use on your hiking or camping trips. 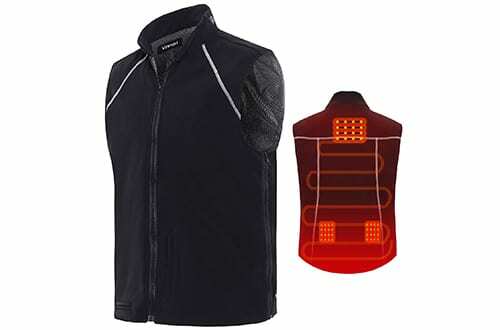 This is a top-rated heated vest with an adjustable method to fit all persons. It is a perfect vest for wearing under a jacket with zippers under each arm. The zippers are easily replaced by panels when you want to expand the vest. It features 5 heating panels and 5 adjustable temperature settings to match any temperatures. You can use this vest on all your hiking and camping trips. It comes with a 7.4V Lipo battery capable of running for 7 hours without charging. Overall, this is a pretty safe heated vest with built-in thermal protection to prevent overheating. The Prosmart is another lightweight fleece heated vest to keep you warm in cold temperatures. 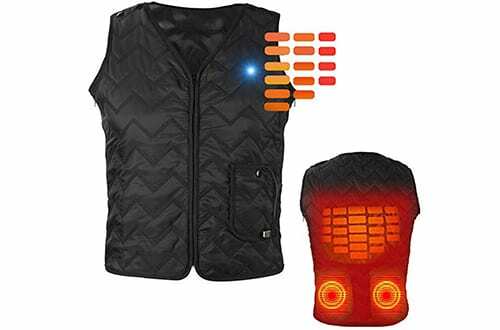 The vest features a heated upper back and lower back to supply vital areas of the body with warmth. It is an efficiently heated vest that heats up rapidly in cold temperatures. This vest features three adjustable temperature settings of high, medium and low to match different needs. It is a quality vest with 10000mAh power bank. It features a convenient phone pocket to keep your phone safely. The OUTCOOL is a premium quality heated vest made of polyamide fiber materials. The vest is 100 percent waterproof and windproof. It is a perfect fit for all weather conditions. It features an inner 230D taffeta material to resist coldness during winter. There are three heating zones to supply heat to vital areas of the body evenly. The vest also allows for three temperature settings of low, medium and high. You can adjust them accordingly to match the weather surroundings. It also features a longer warming time of 8 hours on low heat, 6 hours on medium heat and 4 hours on high heat. 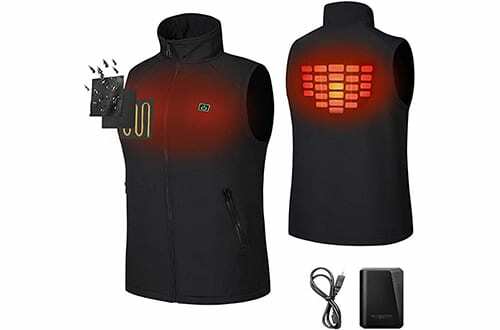 Overall, this is an exciting heated vest with a multifunctional charger. This is a versatile design heated vest with fast 3-second heating. It is a leading brand heated vest compatible with most USB plus power banks in the market. The jacket features high-end coated heated materials without any radiations. It is pretty safe and easy to use. There are 5 temperature settings adjusting from low- high to match your body temperature needs. Overall, this vest is a perfect pick for both outdoor and indoor use. It features four adjustable sizes to fit all people. It is a premium quality heated vest with a soft fleece material weighing 0.5kg. The vest is also machine and dryer safe. It also comes with a free laundry bag to keep the USB cable safe. 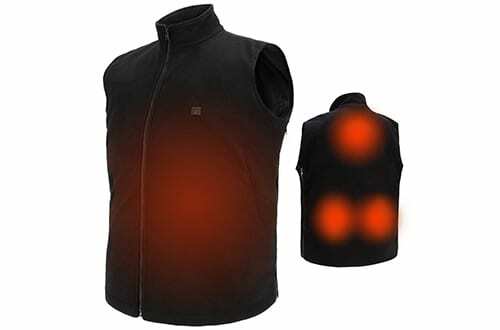 The Venture is a stylish heated vest with three flexible heating panels. It is a quality vest with a built-in battery to boost your core heat in extreme coldness. This is a smooth and efficient heated vest. It heats pretty fast and is very comfortable. The vest features adjustable temperature controls with three heat settings of low, medium and warm. Vest also features 12-hour runtime due to the powerful 5V 10400mAh CE battery. Overall, this vest will keep you warm up to 12 hours on the low heat level, 6 hours on medium and 4 hours on high heat. The vest is also windproof and waterproof ideal for outdoor winter adventures. It is a stylish vest with 3 zippered inner media pockets and an elastic drawstring hem. 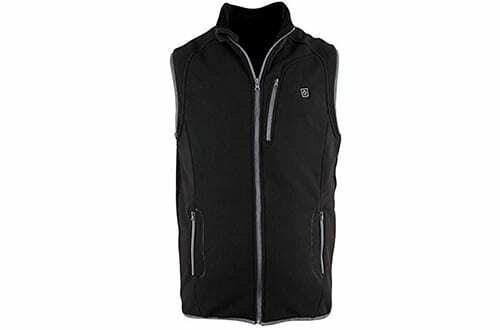 This is a premium quality 100 percent polyester heated vest with lightweight but durable construction. It is a flexible vest giving you unrestricted movement while keeping you warm. This vest helps you ditch heavy and bulky clothes during winter. 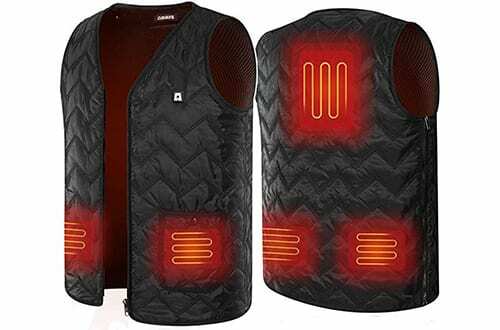 It is a safe vest that delivers safe heating across the body with 5 carbon fiber heating elements. The vest also features three adjustable heat settings to match the weather conditions. Overall, this is a versatile heated vest with wide applications. It is easy to use and features an adjustable waist size. The vest is also easy to clean by machine wash and hand wash. The Vinmori is a multi-pocket design heated vest ideal for use when fishing, doing photography, hunting, shooting and much more. The jacket gives you excellent storage options while keeping you warm at the same time. It does not have any radiation and heats safely with high-end heating materials. This is an adjustable vest with a detachable back Velcro. It features four unique side zippers that easily adjust in four sizes to fit different persons. Overall, this is a breathable and comfortable heated vest to buy and use with confidence. There are 5 adjustable temperature levels suitable for any weather and activity. The vest material is ultra-lightweight, thin and fast-drying suitable for use outdoors. 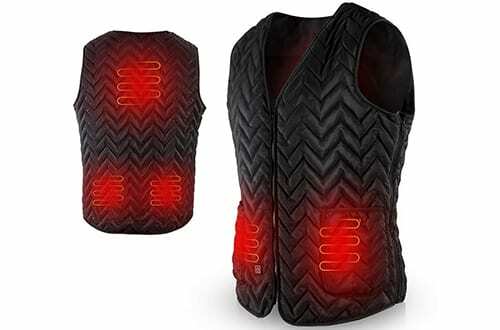 This is another fast-heating heated vest with the latest carbon fibers. The vest starts to heat slowly within 3-5 seconds keeping you warm. It is a high-quality vest with TPU heating sheet. This ideal heated vest is for snow hiking, winter fishing, mountain motorcycling, skiing and much more. The jacket features a soft inner lining to feeling soft and comfortable on the skin. Overall, this is a highly flexible and suitable vest for outdoor activities. It is adjustable in size and can fit all persons. The three built-in heaters keep your body warm and enhance blood circulation. 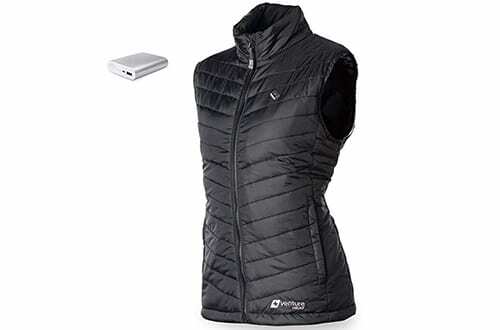 The NORA heated vest is our final best pick on the list with a zipper closure and soft shell fabric. The vest features 93 percent polyester and 7 percent elastane. It is a perfect size vest giving men a relaxed fit. This is a warm, classic and comfortable heated vest with three layers of soft shell fabric. It is mild-waterproof and windproof to keep you safe and dry in rainy and windy weather. Overall, this excellent vest is to offer you unrestricted movement. There are three heating elements with adjustable heat settings. It heats quickly and delivers long-lasting heat. These are the best-heated vests on the market currently to keep you warm in cold temperatures. The highly rated vest comes with excellent customer recommendations. Make sure you choose one today and start enjoying outdoor winter activities without bulky clothes.